Samantha Nadel ’19 recently won the undergraduate poster competition for her research poster presentation at the 75th annual Plains Anthropological Conference in Bismarck, North Dakota. Her poster was titled “An XRF and ICP Spectroscopy Analysis of Ceramics from the Huston-Fox Site (39MD133), Meade County, South Dakota,” and it was co-authored by Lynn M. Alex from the University of Iowa Office of the State Archaeologist and Cornell College Professor of Chemistry Cindy Strong. This was Samantha’s first opportunity to present at a professional conference. Her research was funded by the the Cornell Summer Research Institute and her trip was partially funded by the Berry Career Institute. Nadel believes her time at Cornell prepared her for the conference. 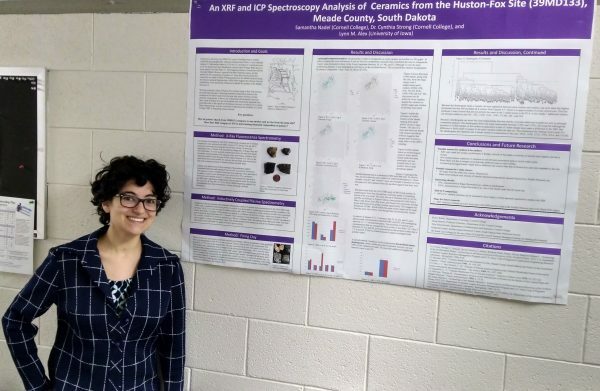 Now that the conference is over, Nadel said she feels inspired to continue her research, work to publish her findings, and pursue an undergraduate research position next summer.